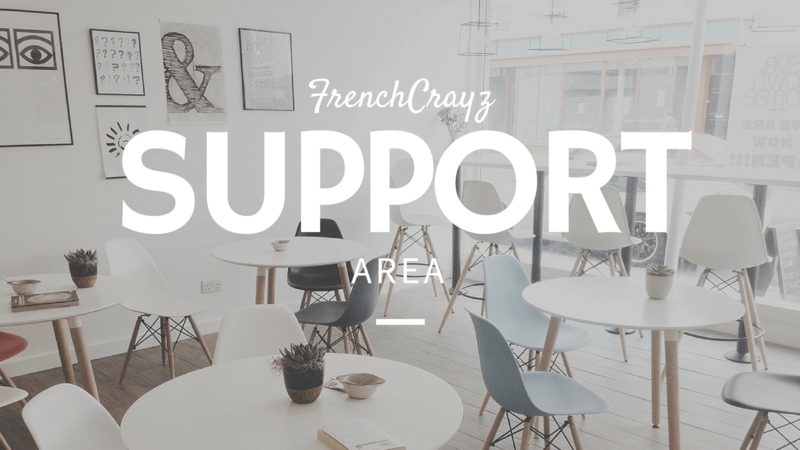 Welcome to the FrenchCrazy Help Center. Here we address any questions you may have about our website. To become a member on FrenchCrazy.com it requires you to purchase one of our premium products from our website. You can view our current offerings from our membership area. Use the username and password you created during the sign-up process. This information was emailed to you just after you signed up. If you have an account on FrenchCrazy.com, you can reset your password at anytime. Simply enter in your email address associated with our website and a reset link will be emailed promptly. If you didn’t receive an email then check your spam folder or verify that you entered in the correct email address. You’ll need your username to login to your FrenchCrazy.com account. If you have an account on FrenchCrazy.com then you created a username during the sign up process. This username has an associated email address and password. If you forgot your username then reset your password by putting your email address into the box. Your username will be sent in the email along with the option to change your password if you desire. If you have an account on FrenchCrazy.com then you can manage it under the account page. Here you view your active FrenchCrazy subscriptions or modify your name, email address, billing information or password. You are unable to change your username. How do I access the guide I purchased? Go to our members area and click on the words “Member Access” under the product that you own. If you are already logged in then you’ll have immediate access to the guide. Enter in your USERNAME (not email address) and PASSWORD to login to FrenchCrazy.com. If you forgot any of these two things, then reset your password to obtain both of them. Likewise, you can check your email history because all this information was sent immediately after you signed up. Make sure you use the same internet tab so that the cookies remain. You’ll stay logged in and have access to the back end of your guide. If you manage to get logged in you can also check to make sure that the subscription is applied to your account under the “subscriptions” tab of your account page. Please ensure that you’re browser is updated. The latest Firefox, Google Chrome, or Safari browser should not have any problems. If you’re still having trouble then retry all the above steps however use a “private browsing” mode to negate any cookies stored on the site. We allow readers to comment on articles and share their thoughts. However before anything appears online, your comment undergoes a two-step moderation process. This requires a bit of time on our part. If your comment was not published yet then there are two explanations. Your comment is still in our moderation process or it was already deemed unacceptable for our website. FrenchCrazy fosters a safe-environment for all our readers. Spam, trolling, hate speech, and profanity are never published. Sometimes you may bookmark a page and find out that you’re unable to access it in the future. We occasionally curate old content, move things, or delete articles. Use the search feature at the top of our site and enter in any keywords you think might help you find the page. The web is a very volatile place! With time, URLs are often moved or deleted, causing you to not find a valuable resource. If any links or images on the site are broken, please just contact us and we’ll do our best to find the new source. Uh oh! While we here at FrenchCrazy strive for 100% accuracy, things occasionally do slip by our editing process. If you’ve spotted a typo or a mistake within one of our articles then feel free to let us know via the contact page. You could also drop a comment on the article in question. Still have a question? Email John at john@frenchcrazy.com and I’ll respond to your inquiry.